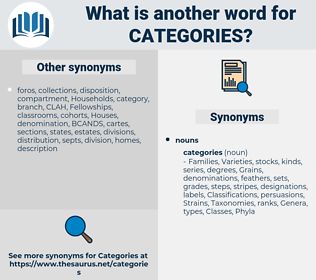 What is another word for Categories? services, ages, data, states, rankings. ranking, rankings, general, ranked, program, registrar, typical, largest, non-commissioned, row, Rang, cuadros, tile, tiles, Stations, postal, NCM, day, may, Matrices, major, Children, sample, public. 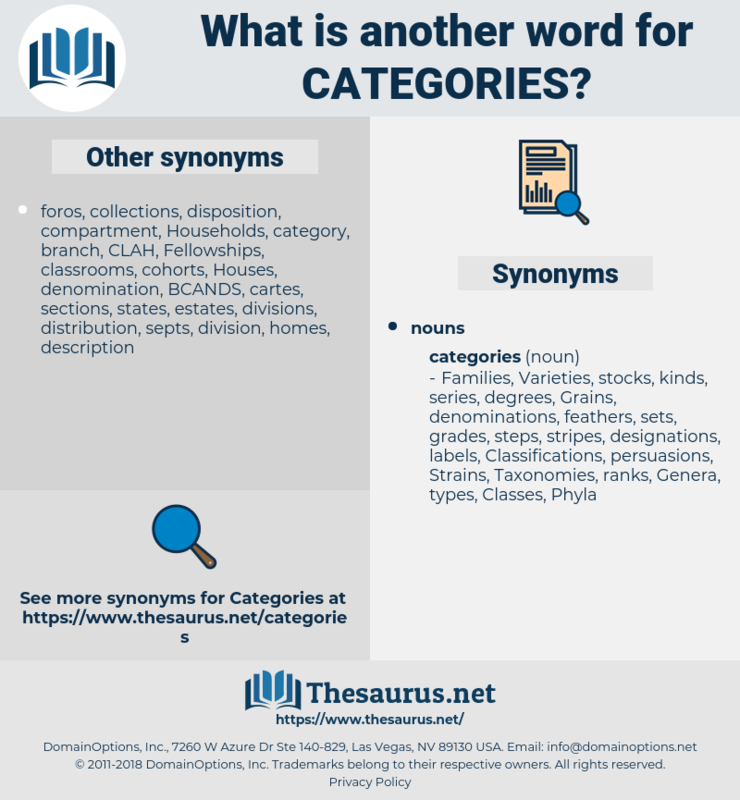 categorizations, subcategories, sub-categories, circumstances, considerations, years, factors, instructions, Organizations, groupes, descriptions, conditions, characteristics, certificates, tranches, Associations, sectors, definitions, regardless, matters, species, denominations, irrespective, targets, purposes, qualifications, groupings, combinations, lists, projects, requirements, scores, segregations, articles, brackets, terms, arrangements, Capabilities, services, Industries, attributes, charts, subsections, equivalencies, appropriations, Criteria, alternatives, prizes, products, courses, parts, ways, programmes, manifestations, cadres, Capacities, actors, statistics, principles, subparagraphs, rates, Varieties, awards, profile, profiles, sub-groups, Environments, acts, stocks, producers, instances, clusters, Areas, government, subheadings, FORMATS, sub-populations, indications, priorities, delegations, topics, packages, forces, Beverages, Countries, Scales, sorting, sources, professions, stages, allegations, typologies, concepts, components, Agencies, directions, chapters, consignments, others, segments, subclasses, pictures, affiliations, gradations, Separations, permanent, aspects, breakdown, breakdowns, trades, Tracks, objects, ranges, Appointments, benchmarks, quarters, vouchers, features, routes, cases, location, trends, Standards, elements, independently, sects, scorecards, provisions, ingredients, totals, comparison, levels, devices, departments, arts, respects, Branches, circles, Uncertainties, participants, processes, applicants, seats, CAMPS, Commodities, assets, Boundaries, applications, disciplines, challenges, indicators, constituents, notes, series, accusations, degrees, labels, objectives, colleges, events, stakeholders, situations, each, portfolios, increments, parameters, factions, details, modalities, Canadians, numbers, sub-headings, exchanges, Entities, layers, Sports, boards, Voices, hours, Activities, Occupations, precedents, allocations, servants, attendances, brands, rental, zones, dimensions, patterns, offences, responses, Strains, Lectures, Prices, Populations, fields, issues, loyalties, Budgets, channels, domains, personnel, Quantities, spectrums, dispositions, tasks, statutes, suppliers, approaches, reasons, streams, scoreboards, Charges, Risks, clearances, Genera, individuals, portions, steps, appears, exists, FACETS, periods, Families, item, officials, versions, Securities, Styles, Identities, highlights, Communities, minutes, cohorts, claimants, submissions, Crimes, settings, limits, Rights, leaders, things, sub-items, instalments, examples, Ones, Abilities, rumours, Goals, workers, spheres, panels, Vehicles, slices, Duties, departures, points, fries, claims, five, actions, age, ages, pillars, Persons, Indexes, Indices, criticisms, themes, people, marks, paintings, echelons, annex, Involving, modes, solutions, functions, peoples, fronts, Expenditures, columns, classrooms, S, odds, months, pieces, ensembles, starts, interests, strands, outputs, baskets, blocs, backgrounds, grounds, shutters, Investments, Parties, thrusts, pools, hazards, Assemblies, managers, Boxes, frameworks, laws, audiences, employees, Tests, ;, Axes, blocks, flaps, shapes, women, sessions, skills, officers, citizens, data, figure, figures, seekers, symbols, trips, various, sizes, fellows, sets, headlines, beings, guys, gangs, variables, counts, dudes, options, diapers, bands, lessons, squads, designs, banks, Survivors, plans, texts, media, between, rounds, units, Studies, problems, squares, Phases, slabs, Firms, clues, boys, states, Bays, heads, Chips, fellas, stuffs, Friends, kits, Animals, chiefs, possible, men, 72, signs, news, funds, flows, expenses, 34, Bases, sides, rankings, drinks, goods, LINEs, Rang, tiles, Stations, Matrices, Children. tiers, professionals, Constituencies, orders, titles, subjects, divisions, grades. With respect to the method of their election, the members fall into two categories. Instead of being treated as modes of conception, more or less justified by their use and their results, these categories will be regarded as fundamental facts, essential conditions of all reality.